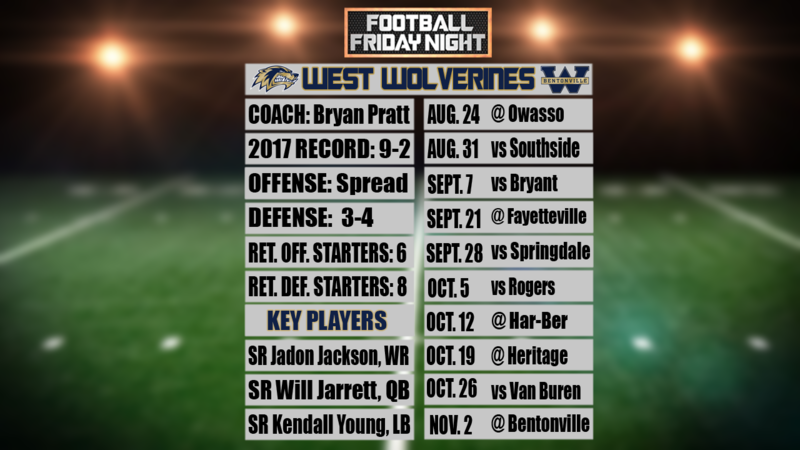 Centerton (KFSM) - Entering year three, Bentonville West won't be sneaking up on anyone anymore. "There are higher expectations, we set that standard last year, that winning standard,” admits senior Kobe Anderson. After winning just three games in the program’s first year of existence, quarterback Will Jarrett admits that, before last year “people looked over us.” But now? Winning nine games in a row to start the 2017 season will do that. “I feel like people expect something from us now, just because of how we did last season,” says senior Austin Ewbank. Jarrett is embracing the challenge. Head coach Bryan Pratt has been with this group of seniors from the start. He says the energy among the school and community is at an all-time high. And the fans and players finally have a stadium to call their own, after two years of playing home games down the road at Bentonville. “Now that we’ve got our own stadium, it just feels good,” says senior Jadon Jackson. Of course, all that really matters is how the team plays on that field. Jarrett and Jackson return to form one of the most dynamic and explosive quarterback-wide receiver duos in the state, in an offense that likes nothing more than to go fast. The defensive line out a lot to graduation and injuries, but the defense as a whole is solid, lead by senior linebacker Kendall Young. Despite all that happened just a year ago, Kobe Anderson still believes the Wolverines will sneak up on some people. That game one will be at defending Oklahoma state champion Owasso on August 24th, before the new stadium gets its first taste of action August 31st when Fort Smith Southside comes to Centerton.